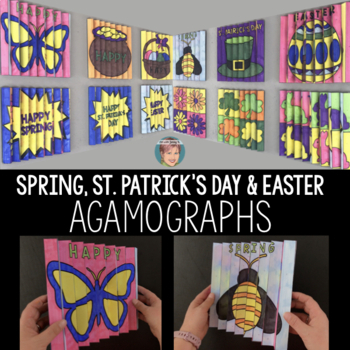 Agamograph Collection for Spring, Easter & St. Patrick's Day | Fun Spring Craft! 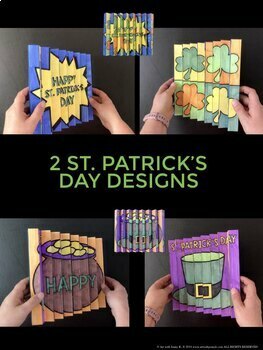 This agamograph collection includes designs for St. Patrick's Day, Easter, and Spring. My agamographs are a fun and unique way to integrate art into your classroom with a huge "wow factor"--students love the surprise of seeing the final project "change" images. And best of all, they did it themselves!! What's an agamograph? It is a picture that morphs into another when you look at it from a different angle. 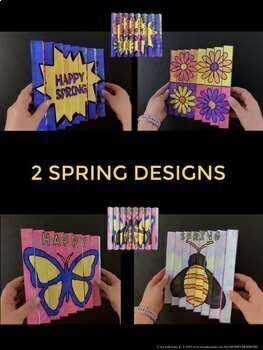 It's hard to say but easy to do--and as the original developer of these fun projects on TPT, I have done everything possible to make this a successful project for you and your students. I've even included a complete teaching video! Agamographs are often used by art teachers; however, I’ve taken out most of the “prep and mess” so that classroom teachers and parents can find this useful and fun as well as art teachers. This project makes a big impression. 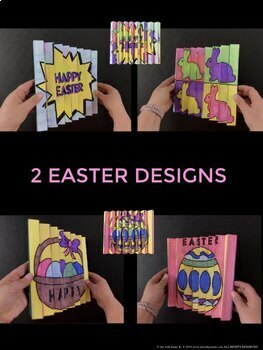 For occasions like St. Patrick's Day, Easter, and Spring, this project is one students can make that won't soon be forgotten. I promise that it is easier than it seems...and once you've created one, the next one is a piece of cake! I've already “spliced” the images together and each space has been assigned a color. Students color them and then fold them. Once completed, students can walk from one side of the image to the other and watch it change! Video--let me do the teaching! Allow me to do the teaching by using the video step-by-step, pausing as you go and letting kids work through this process. Once you purchase this resource you'll be able to stream the video through YouTube or download it from Dropbox. Interested in other holiday resources?? © Copyright 2019 Art with Jenny K.® ALL RIGHTS RESERVED. Permission is granted to copy pages specifically designed for student or teacher use by original purchaser or licensee. The reproduction of any part of this product is strictly prohibited. Copying any part of this product and/or placing it on the Internet in any form (even a personal/classroom website) is strictly forbidden. Doing so is a violation of the Digital Millennium Copyright Act (DMCA).